I usually try to lay off of anything political in everyday conversation, and especially in blogging. It’s very easy to get into a political conversation with someone you like and suddenly you don’t like them anymore. But there’s a topic that’s unfortunately political, and also food-related that I can no longer hold my tongue on. School lunches. Many moons ago, when my kids were younger I was director of food services for both a private elementary school and for a resident scout camp. This is when I was disenchanted with the evenings/weekends/holidays schedule of traditional cooking jobs. Ironically, I now plan events and sell wine which tends to be evenings/weekends/holidays- it’s the inevitable evil I guess in my line of work. But I digress. Suffice it to say I can confidently say that I know about feeding children, both my own and other people’s. Over the last few years I have seen school lunches become a hot topic on tv, the internet, and Capitol Hill. I have seen many people become a mouthpiece for “school lunch reform”. Some who are definitely qualified to do so, others notsomuch. Many advocates for school lunch reform support getting rid of “junk foods” in schools and getting back to “scratch cooking”. Are these both good ideas? Of course. But are they realistic? Maybe not. Here’s why. School lunches in schools actually originated in the early 1950s as a way for the USDA to unload surpluses of food that would otherwise spoil. Both then and today these surpluses were mostly made up of corn. Today, public schools (and some private ones as well) still depend on government subsidies for the livelihood of their school lunch programs. In fact, the number of days and half-days that children are in school is directly related to how many days the children need to be in school to receive benefits from Uncle Sam. The First Lady decided to tackle childhood obesity and school lunch reform as her pet projects during her husband’s term in office through various initiatives such as “Let’s Move” and the “Healthy Hunger-Free Kids Act“. Sweeping changes have occurred in schools such as no soda machines during school hours, salad bars in school cafeterias, and the cutting of flavored milks. These changes also prohibit fundraisers such as candy bar and bake sales. As a former “lunch lady” I can tell you what these changes are doing to school lunches. There are strict USDA policies of what goes on that cafeteria tray every day, and there’s a pile of paperwork each day that needs to be filled out showing that the school is adhering to guidelines in order to get benefits for their programs. There are certain items that have to be bought and served to kids regardless of whether or not they will eat them in order to meet federal guidelines. These items, regrettably, end up in the trash and come out of the school’s lunch budget. The balancing act comes from attempting to make these items as attractive as possible, and minimizing the hurt put on the school’s lunch budget by purchasing them. Ok, so let’s do some of that “scratch cooking”, get creative, and make those unattractive lunch options (aka fruits & veggies) more appealing to the kids! Jamie Oliver had a fantastic tv show both in the US & UK called Food Revolution where he rolled in with his culinary team and taught old school lunch ladies easy and creative new recipes that the kids devoured with relish. Unfortunately, Jamie can’t get to every school and the sad reality is that the majority of folks employed in the making of school lunches simply don’t have the skill set needed to make nutritious meals from scratch. Those who do have the skill set often would not work for the modest wages paid by school lunch programs. Further, the schools would definitely not have it in their budget to pay these cooks for the extra time they would have to put in to cook meals from scratch. So what would work? Well, clearly the government will not be getting off of our children’s lunch trays any time soon, so let’s put that federal money where it will really count. Let’s retrain existing school food service workers so they have the skills to go above and beyond popping a processed frozen pizza in the oven. Let’s pay a wage that will attract people with the proper skills to creatively transform school lunches to be both delicious and nourishing. 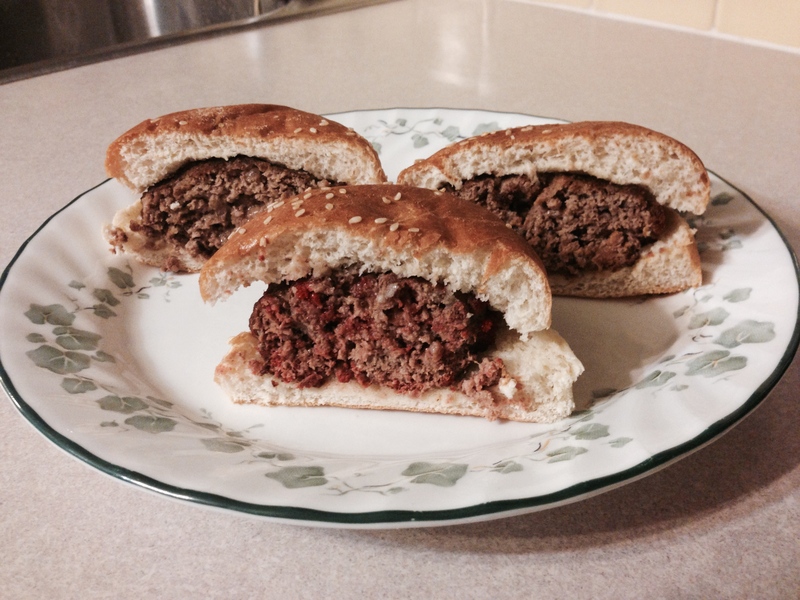 Last week, my son (age 17) came to me with an idea for a recipe that he had come up with. 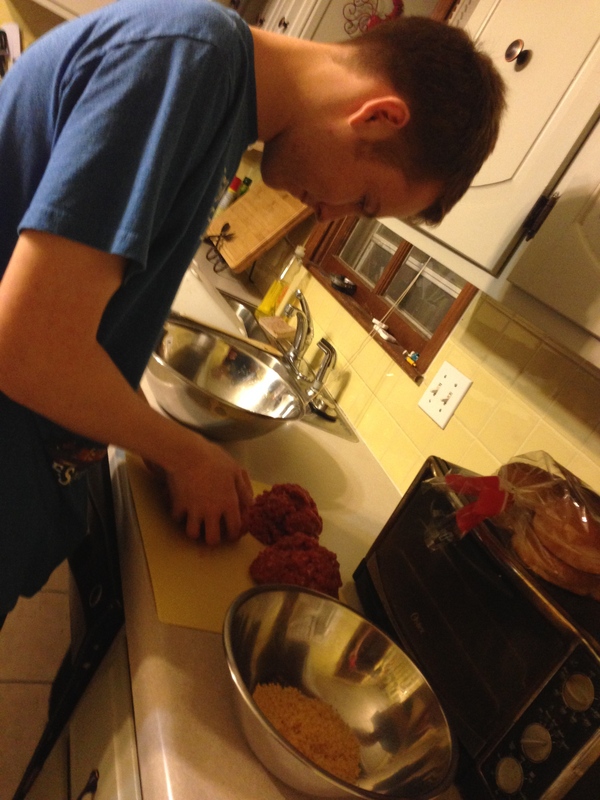 He wanted to make burgers (or meatloaves) using Funyuns, Cheetos etc. as a binder. And yes, he used the word binder (we watch a lot of Chopped at my house). I poked around a bit online and wasn’t able to find another recipe like he was proposing (chip off the RFB block!) I gave him a little help with ratios of meat/egg/binder and we gave it a go last night! 1) In a large bowl, combine ground beef and eggs. Mix by hand until combined. 2) Divide meat into 3 equal parts and set aside. 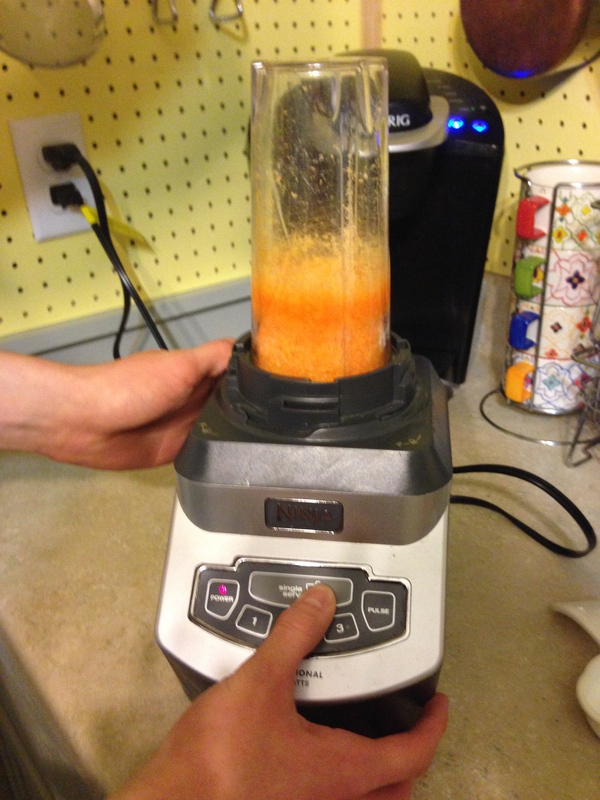 3) Using a blender or food processor, pulse Funyuns until they are fine breadcrumbs. You want to have about 1/4C of fine crumbs. FYI when you grind up Funyuns and Cheetos they leave behind a slightly disturbing greasy residue. See that dark orange stripe? 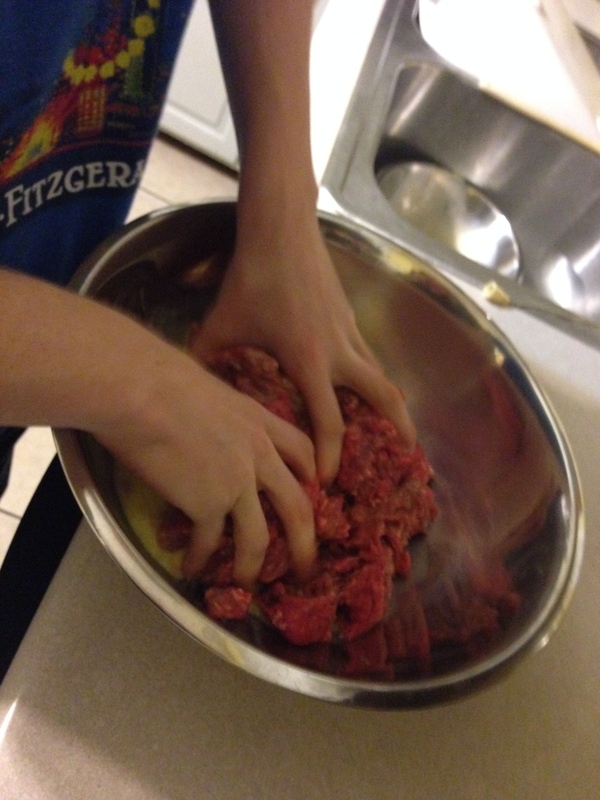 4) Combine Funyuns with first ball of meat. Mix by hand until combined. 5) Divide into 4 burger patties. Set aside. 6) Repeat steps 3-5 with Cheetos, and Flamin’ Hot Cheetos. 7) Spray broiler pan lightly with cooking spray. 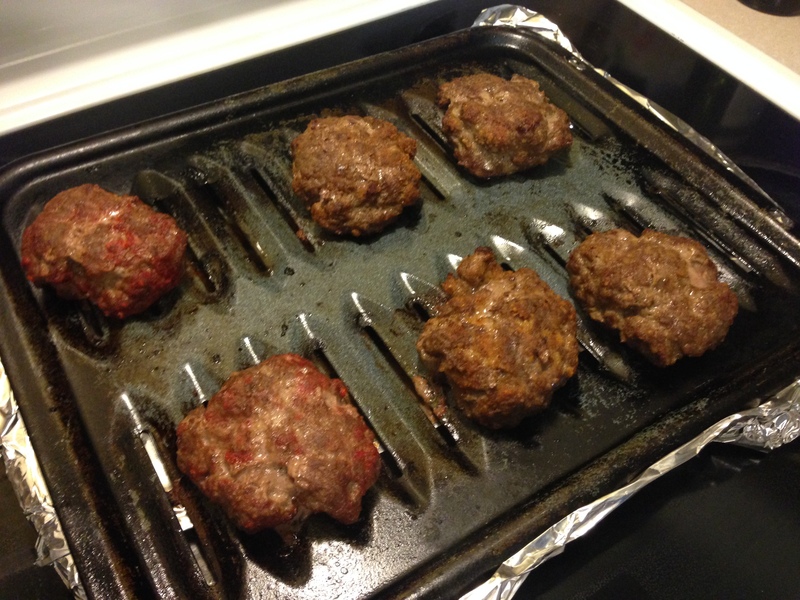 8) Broil burgers about 5 mins each side. 9) Remove from oven and allow meat to rest 3 mins before serving. 10) Serve on buns, with condiments, if desired.